The sunken village of Bakota Village is one of the most intriguing historic sites in Ukraine, but it can be a challenge to visit without your own transport. 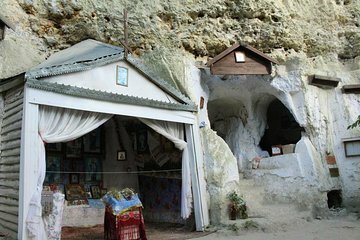 On this private full-day tour from Kamianets-Podilskyi, discover the fascinating history of the ancient settlement, explore the Bakota cave monastery, and visit the sacred springs of the Dniester River canyon. Hotel pickup and drop-off is included.